An ex-Royal Marine and Liverpool gym owner is pushing his physical boundaries in aid of Movember. The owner of Anytime Fitness Maghull, Alex Ivanoff, toured Iraq and served as a bodyguard protecting cargo ships from Somali pirates. However, life-changing injuries forced doctors to medically discharge him. He hopes that by forcing his body to the limit in a gruelling gym-based 60km run will help Movember in reaching their goal of reducing suicide by 25% by 2030. Recent figures show that men remain three times more likely to take their own lives than women, with 4,694 male suicides in the UK last year. Initially for Alex, what was thought to have been a check-up on a previous injury turned out worse as medical experts revealed news that came as a shock to him. He told JMU Journalism: “I broke my back in 2003 in Iraq during the invasion; I was hit by debris from a wall explosion. An RPG [rocket-propelled grenade] luckily missed me but hit the wall. I didn’t realise I’d broken it until 10 years later, when I went for a scan and they found bone fragments. 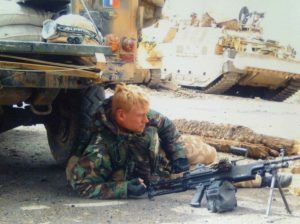 Mental health is something that has personally affected Alex, who is afflicted by Post-Traumatic Stress Disorder, following his time in the Special Forces. He revealed: “From my time in the military and as a bodyguard, I suffer from PTSD. I’ve occasionally struggled with my mental health and I hope we can provide a bit of extra support for the foundation, bettering mental health support networks. “I used to feel embarrassed if I couldn’t explain why I felt down in the dumps or had nightmares. You don’t know what impact it can have – you can drive girlfriends, friendships away. You don’t know why and it spirals. Donations can be made to Alex’s Anytime Fitness Maghull’s Facebook page.